If you’ve never heard of a weighted blanket or a gravity blanket as they were once known, the clue is in the name. They are blankets that are weighted down with beads made of materials that make the blanket heavier, like glass or metal beads, blended fabric pellets, extra pounds of cotton, and sometimes millet. Why would you want a blanket with glass in it you may ask? Well, the answer is simple: the extra weight is supposed to aid with sleep while having a calming effect on your nervous system. That’s why parents of autistic children have jumped on this trend and are trying out weighted blankets to help their autistic kids get some sleep. There’s a thing called DTP (Deep Tissue Pressure) that you may have heard of if you’ve ever had a deep tissue massage. Pressure on your skin releases both serotonin and dopamine which causes you to relax – chemicals that are sorely lacking in autistic children. When used in weighted blankets, it’s like sleeping in the wrapped warm arms of a parent, with the right amount of pressure to release those chemicals in the brain. It doesn’t just help children with disorders like autism either. There is some evidence that adults who suffer from insomnia have also found success falling asleep under weighted blankets. Naturally, an adult weighted blanket is going to be much heavier than one for children and that is an important caveat. You have to be careful when you are looking for weighted blankets for children. The weight matters. Getting it right, according to Autism Parenting Magazine, depends on how much your kid weighs. The ideal blanket should be 10% of their body weight with a couple of pounds of material added to it. For those of you who have been thinking about trying weighted blankets for autistic children, you are in luck. We found 10 of the best! They range in sizes and weight from toddlers to teens. Take a look and make sure to read to the end for some important product information. Many elementary and middle school aged kids suffer from autism. This ultra plush 7 layered Premium Kids Weighted Blanket from Quility is just what the doctor ordered for your autistic preteen. It’s suitable for kids weighing between 90 and 120 pounds (or 12 – 17 years old). There are two layers filled with 10 pounds of tiny glass beads squished between an airy layer of pure cotton, padded with polyester. We love the removable duvet made of a silky mink-like material. It works in summer or winter. Just unzip the outer layer for cooler sleep and put it back on when it’s cold. When you choose the Weighted Blanket from YnM, you have your choice of duvet materials. You can choose a cotton or bamboo duvet for cooling sleep or the warmer mink-like cover. The top layer of the blanket is made of 100% cotton wrapped around seven layers of softness. Made with less stuffing for cooler sleep, there are millions of itty bitty glass beads inside that add 10 extra pounds to the blanket. Yet the way that they are sewn in is made to reduce noise and to keep the beads from jostling around while at the same time wrapping your body gently for ideal sleep. In our search we found a terrific blanket for elementary school aged kids. One of the best out there is the 7 pound Weighted Blanket for Kids from Harkla. It is light enough for kids weighing between 40 and 70 pounds (or 5 to 10 years old). It comes with a soft removable duvet. Some weighted blankets lose their stuffing when machine washed so they have to be dry cleaned. Not this one! This is easy to wash at home and it comes with a lifetime guarantee! Stitching ensures that the weight is evenly distributed and the puffy cotton feeling makes falling asleep a breeze. Another excellent choice for your elementary aged autistic child is the 5 pound Weighted Blanket for Kids from BUZIO. It’s perfect for kids weighing between 40 and 70 pounds, especially if 7 pounds is a little too heavy. Unlike some of the other blankets on this list, there is no duvet cover but it is just as soft. Best of all, if your kid has allergies, this is the one you want. It is stuffed with hypoallergenic premium organic cotton and weighted down with glass beads. If you are looking for something to test out, this is your guy! Next on our list is the Child Small Weighted Blanket from Weighted Blankets Plus. This one is designed to add medium pressure, just in case the standard 12% body weight is too much. The makers of this blanket say it helps with all kinds of disorders like autism, Asperger’s, PTSD, insomnia, sleep apnea, and more! The thin outer layer is made of cotton flannel. You can see that this blanket lacks the fluffiness of the others on our list. That’s because the glass beads inside are as small as sugar granules, so you actually can feel the pressure without feeling the many teeny weenie beads inside. Autism affects kids of all ages, including teenagers. Our pick for teenagers is the Premium Weighted Blanket from Platinum Health. It’s one of the heaviest blankets on our list at 15 pounds and it is bigger – more like a comforter. It also comes in seven different color combinations! Plus it comes with a super soft duvet cover. Inside the weight of the polyfill and minibeads are evenly distributed. 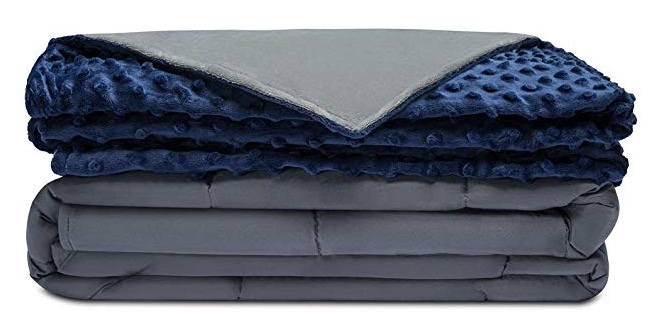 One of the things we love about this weighted blanket is that it is reversible and has a cool side for hot sleepers. For older kids dealing with autism, this is our top pick! Although the Calming Weighted Blanket for Kids from Hazli weighs 5 pounds, it is designed for kids weighing up to 55 pounds (or ages 4 to 7). Evenly distributed weight helps keep kids feeling comfy and snug. Its unique design is made to keep little ones from getting too hot or too cold. Filled with hypoallergenic pure cotton, there is an added layer of microfiber to keep the blanket cool. There is also a duvet included made of mink-like fabric for added coziness. You can wash the duvet in your washing machine at home. Best of all, this blanket was designed with restless tots in mind who have trouble falling asleep. If you are the parent of a preschooler who has been diagnosed with autism, finding the right weighted blanket can be hard – except we found one of the best for you! This Weighted Blanket for Kids from Mindful Grasshopper weighs 5 pounds and is made for kids between 30 and 40 pounds (or 3 to 5 years old). Filled with glass beads, this super soft and durable blanket can be used for really small kids who struggle with sleep or autism. 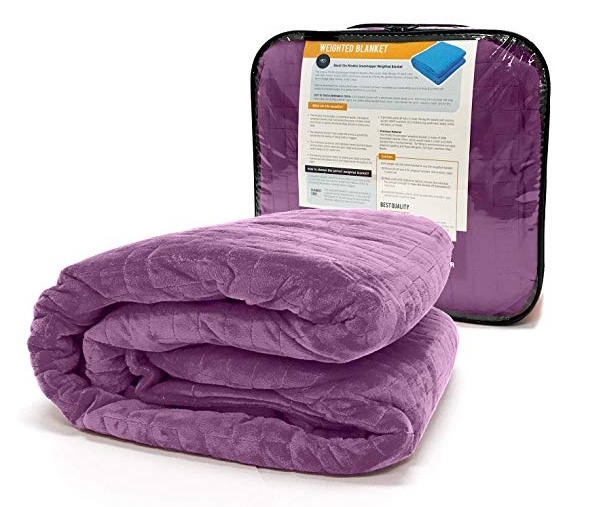 It even comes with a duvet plus an e-book to help you understand all of the benefits and uses of weighted blankets to help with their condition. We love the range for the Weighted Blanket for Kids from Gravaria. For those of you who have tried heavier blankets for your 9 year old and found it to be too heavy, here’s the solution. 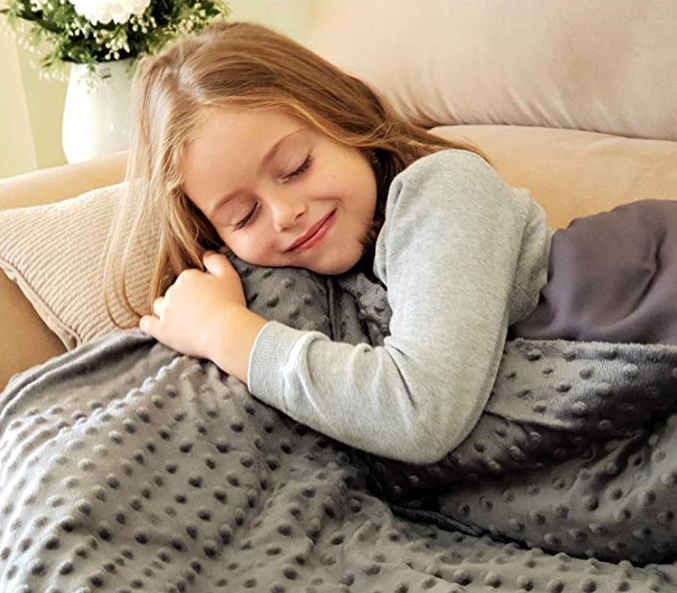 This weighted blanket is made for kids weighing between 40 and 60 pounds (or 3 to 9 years old). Instead of beads, the weight is created by a slew of little glass pellets smooshed between layers of premium poly-blended fabric. It is designed using little pockets of beads to ensure that the weight is distributed evenly so that the beads don’t bunch up over time. Finally on our list is another weighted blanket with a unique age range. The Weighted Blanket for Kids from Snuggle Pro weighs 7 pounds and is designed for kids weighing between 60 and 90 pounds (or 8 to 12 years old). It uses bamboo in the mink-like duvet to keep kids from getting overheated. We also love that the duvet is reversible and removable. Inside, the blanket is filled with glass beads that have been placed between soft high quality fabric in a way that prevents shifting and noise while evenly distributing pressure. Machine washable, this baby will snuggle your baby all night for calm and peaceful sleep. Some autistic kids could use the benefits of DTP not just when they are asleep but also throughout the day. For these kids, we found some bonus products that you will love. First up is the Weighted Compression Vest from Fun and Function. If your child has trouble focusing in school, sitting still in class, or taking long trips because of restlessness, try this! This compression garment adds enough pressure so that it feels like your child is walking around in a warm embrace all day, making them calmer and more focused. 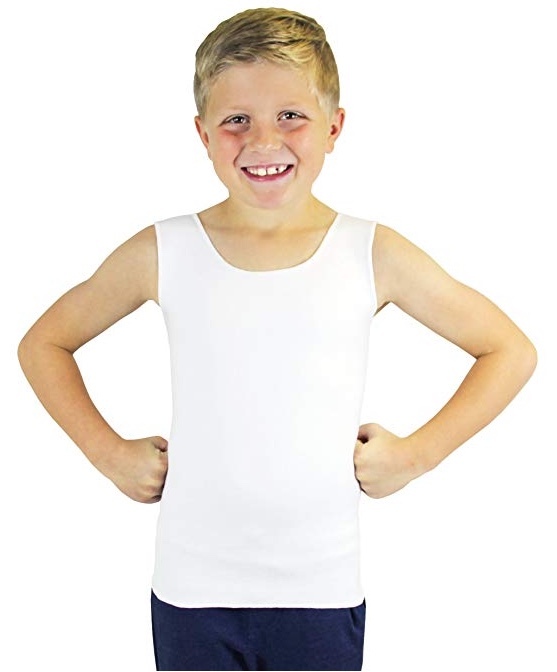 Maybe your kid wants a vest that looks less like a compression garment and more like any old vest. We found this good looking Weighted Vest for Kids from ZooVaa. It is perfect for wearing over their clothes as an inner jacket or as part of an outfit. The outer layer is made of denim while inside, there is an additional three pounds of removable pressure weights. Because of that, this vest is completely machine-washable. This wonderful item gives kids between the ages of 7 and 12 deep tissue therapy all day long. Autistic kids have enough to deal with in school. Feeling different can really hurt their self-esteem. 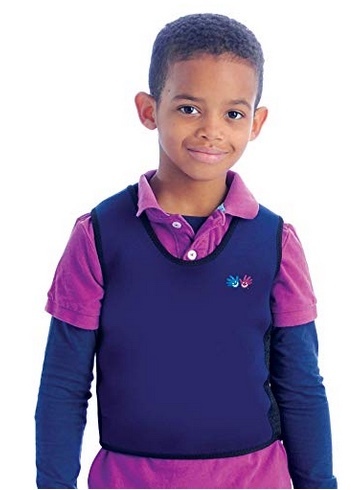 That’s why we adore the Compresso-T Deep Pressure Sensory Compression Undershirt from SmartKnitKIDS. Unlike a noticeable compression vest, they can wear this tee under their clothes and no one is the wiser! 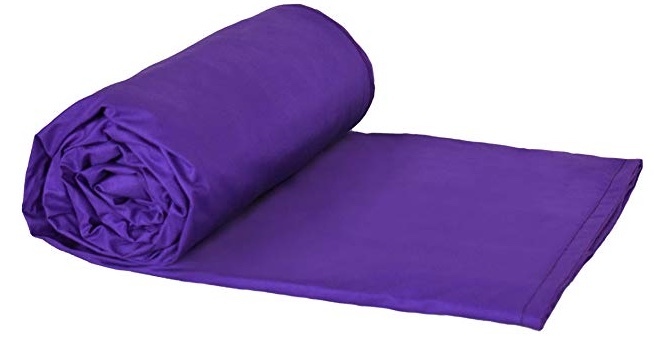 Made of Lycra and polyester, it is soft, stretchy, and compressing enough to apply gentle pressure all day. It is even made with wicking yarn to keep kids dry if they overheat when they play! They can wear it under their clothes or pajamas for DTP anytime. While we know that this list includes some of the best weighted blankets on the market, we feel that it is important to say that the scientific evidence of the effectiveness of these blankets is still wishy-washy. There has not been enough research done since the first gravity blanket appeared back in 2008 to show that it does or doesn’t work. Early studies used samples that were too small to really make a scientific judgment. More recent and bigger studies have shown mixed results. For instance, the Journal of Sleep and Medicine Disorders conducted a study back in 2015 for adults with insomnia and found that it did improve sleep by decreasing restlessness. On the other hand when the Journal of Pediatrics published a study a year earlier dealing specifically with children suffering with autism, the results didn’t show significant improvement between the placebo group and the test group. And the most recent study reported by Psychology Today showed that although the parents and kids in the study preferred the weighted blanket, there was no significant difference in effectiveness between regular blankets and weighted blankets for kids on the ASD spectrum. Bottom line is more research needs to be done in this area. It may not work for you or your autistic children, but some parents swear by it and some adult insomniacs are getting restful sleep now thanks to their weighted blankets they believe. It may work, it may not, but when you’ve tried everything else to help your autistic child get some calm, peaceful sleep with no success, we think that it’s worth a shot!